SIMAGE : We are not only judged by the color of our skin, or the content in our skin, we are judged by the content on our skin. Muhammad Ali : The man who has no imagination has no wings. 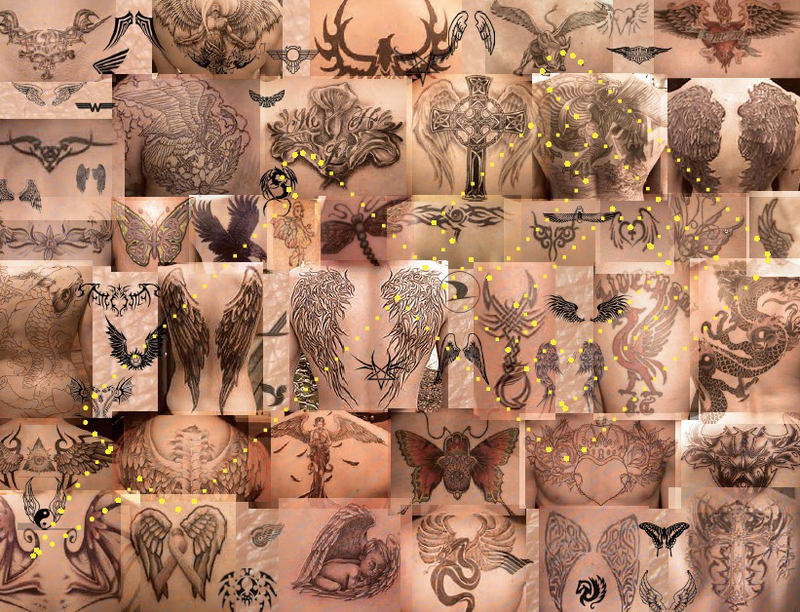 SIMAGE : Tattoos are the definitive approach for bodies and images to blur into each other. The sanctity of the body has been violated and in some ways been sacrificed to the altar of image. Conversely, the image empowers the body, with attributes seemingly raising it above the state of mere mortals. There is an implication that wings were “earned” like a military medal and that we were trusted into an alchemy of the body with its magical and transformative powers. Wings claim to be a symbol of courage, enlightenment and purity, protection, and also to elevate us toward the realm of creatures to mingle with mythical dragonflies, fairies, cupids, dragons, griffins, and Pegasus—let alone the angels of heaven. The alchemy of skin, image and wings seemingly grants access to a previously unattainable state. Marc Jacobs : I have a lot of tattoos. My first tattoo I had when I was a teenager was just a little heart. Jessica White : I have 18 tattoos. My tattoos have kind of become their own person. Everybody does stories on them. It is risky to be successful in the fashion industry and to tat your body up, but I figured, the way that I made my career and the way that I am successful is because I have always been myself. SIMAGE : The tattoo artist works at once on the image and the body. If the tattoo may be seen as a form of clothing, for life, should we think of the creator as fashion designer? Karl Lagerfeld : I think tattoos are horrible. It’s like living in a Pucci dress full-time.